The second pain which causes these holy souls much suffering, is the time lost in life, when they might have gained merits for Heaven; and the thought that they are unable to repair this loss, because the time of life and merit is passed. Woe to me, unhappy being, so many years have I already spent on earth, and have earned naught but hell! I give Thee thanks, O Lord, for granting me time even now to atone for my sins. My good God, I am heartily sorry for having offended Thee. Send me Thy assistance, that I may apply the time yet remaining to me for Thy love and service; have compassion on me, and, at the same time, on the holy souls suffering in Purgatory. 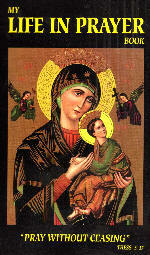 O Mary, Mother of God, come to their assistance with thy powerful intercession.